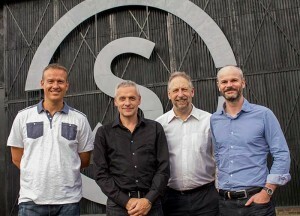 Stage One, the company who realized Thomas Hetherwick’s spectacular cauldron for the London 2012 Olympics, has announced three new appointments to its senior management team. Alan Ellis, Tim Leigh and Andy Smith join the business as performance director, client services director and head of projects respectively, at a pivotal moment for the business as CEO, Mark Johnson, explains: "The last two years have been fantastic for Stage One. The London 2012 Olympics firmly established us as world leaders in the design and manufacture of automated control systems for large scale public events. "We have also developed our use of advanced materials, working on a range of stunning architectural pavilions, most recently completing internal features for Zaha Hadid’s extension to London’s new Serpentine Sackler Gallery. This included using FRP to manufacture the Zaha Hadid Architects-designed wrap for the show kitchen and bar, located in the new restaurant. "We were thrilled to receive a Queens Award for Enterprise earlier this year, in recognition of ten years of Continuous Innovation. And it’s great to be so busy now, working on contracts to deliver complex elements of the Sochi 2014 Winter Olympic ceremonies. "However, we are keen to build on these fantastic foundations and do what we do even better and more competitively. Our aim is to respond to the call for our collaborative and innovative skills in new areas and develop partnerships that can bring ever more challenging ideas to life. "In short, we want to become the world’s most creative construction and manufacturing company, and believe our three new colleagues will help us to do just that. We are delighted to welcome them to the team." A former client of Stage One, Alan Ellis has more than 30 years’ experience working in the entertainment and live events industry. He has recently been helping the company review its business, and determine its future direction. He has helped shape a strategy to aid the team in developing their skills and expertise in new and exciting areas. In his role as Performance Director, Alan will lead the senior management team and influence every aspect of the business to make sure that Stage One delivers on its Strategy. Tim Leigh joins Stage One from FPP Europe – a leading creative brand communications agency. In the past 20 years, Tim’s diverse career has spanned technology, consultancy, marketing and business development with some of the best-known global brands, based both here in the UK and in Europe. He will bring his extensive experience to Stage One, helping to establish and nurture world-class client relationships throughout the business. Andy Smith will be helping Stage One to evolve and develop its work, particularly in architecture and specialist installations. His experience as a leading senior professional practitioner with extensive blue-chip clients, as well as a contractor and construction consultant, will be invaluable to Stage One. Most recently he worked on the £127 million Manchester City Football Club Academy, being responsible for all aspects of project management for this development.